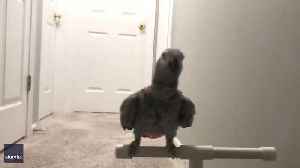 Petra the African grey parrot is a big technology fan, having previously hit the headlines for her use of Amazon’s Alexa device. Now, she’s getting to grips with a Roomba robot vacuum. One of..
Petra the African grey parrot is a big technology fan, having previously hit the headlines for her use of Amazon’s Alexa device. Now, she’s getting to grips with a Roomba robot vacuum.One..